Hello! If you’re popping in on the Bob-A-Long welcome to Daydreams of Quilts! If you haven’t heard of the Bob-A-Long and you’re saying. “What the heck is a Bob-A-Long?” Well, you’re in the right place because I’m about to tell you. Normally when we hear the phrase bob along we think of bobbing our heads along to an awesome song on the radio but in this case it means sewing along while making The Bob Bag designed by Quilt Jane. 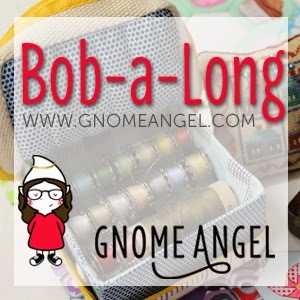 And if you’re playing your awesome music you can bob along while sewing in the Bob-A-Long! How perfect would that be!? My version of The Bob Bag in orange. My colour choice was dictated by the orange grosgrain that came wrapped around a pair of Joe Fresh pyjamas I bought for my daughter last week. Basically it’s like a quilt-a-long but we’re sewing an awesome little box to keep our bobbins in when we’re out and about with our English Paper Piecing (EPP) projects. This way we can take an assortment of threads with us but we don’t have to take several large spools. Or, if you don’t EPP this would also be a fantastic little box for your Wonder Clips or other small sewing notions. I will share some of my tips with you if you would like to make one too. 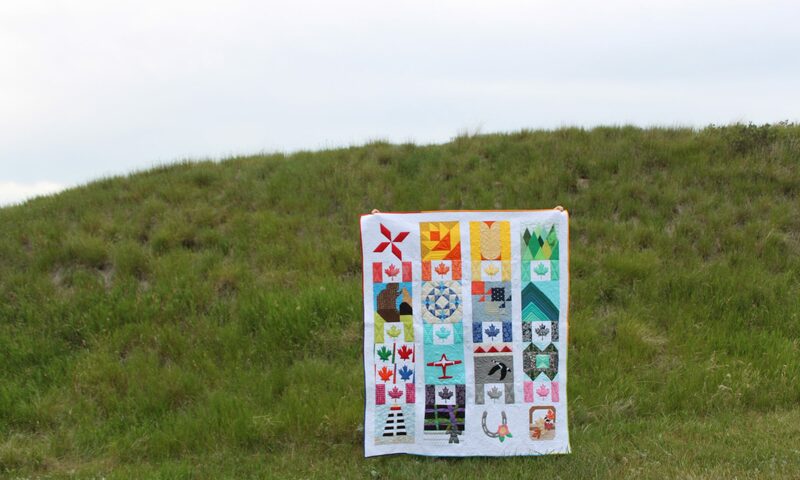 And bonus: Instead of the hours it takes to sew a quilt you can have this project done in an afternoon. You can make it with bolts to put your bobbins on or without if you would like to keep something else in the box. First tip: If you are like me you don’t just sew (although sewing is what I live for besides my children). You also paper craft, scrapbook and have a few other creative hobbies too. I used my paper crafting tools in this project. I used my “Cropadile” hole punch to punch the holes for the bolts. You can use a regular punch too but if you already have the Cropadile, use that because that puppy can punch through chip board so it can definitely punch through fabric. I also used my paper scorer to score the lines on the cardboard insert that’s hidden inside the fabric. This gives a nice crisp fold in your cardboard. If you don’t have a paper scorer you could use the scoring blade on your paper trimmer or a bone folder. I had originally planned to use a co-ordinating blue fabric on the outside of the bag but I didn’t have enough blue twill so my colour plans changed halfway through the project. Second tip: See if you can use what you have before you buy supplies. I live in a small town with limited access to craft supplies. A lot of my supplies are ordered online. For this project I didn’t have time to order things in. When I discovered I didn’t have a long enough piece of twill for the zipper sides of the box I looked through my things and found this sturdy orange grosgrain that’s almost like twill. It was salvaged from the packaging on a pair of pyjamas I bought for my daughter. Then I found matching home decor weight fabric in my stash that I got in my last Japanese Colour Club order. It was perfect! I also didn’t have the right size of zipper so I used one I had that was two inches longer and it still worked out great! I am so happy that I was flexible with my colour choice because I love this cheery bag. The fabric came from Japan and the text says “We love things delicious. For example fruit & sweets.” I think this little bag is delicious too! Love your color choice and I am so glad to hear you can use something other than twill I haven't bought the pattern yet because I wanted to see if my local shop had it. Now I will. What a neat little project! Love it. Colours are wonderful. Thanks for sharing.